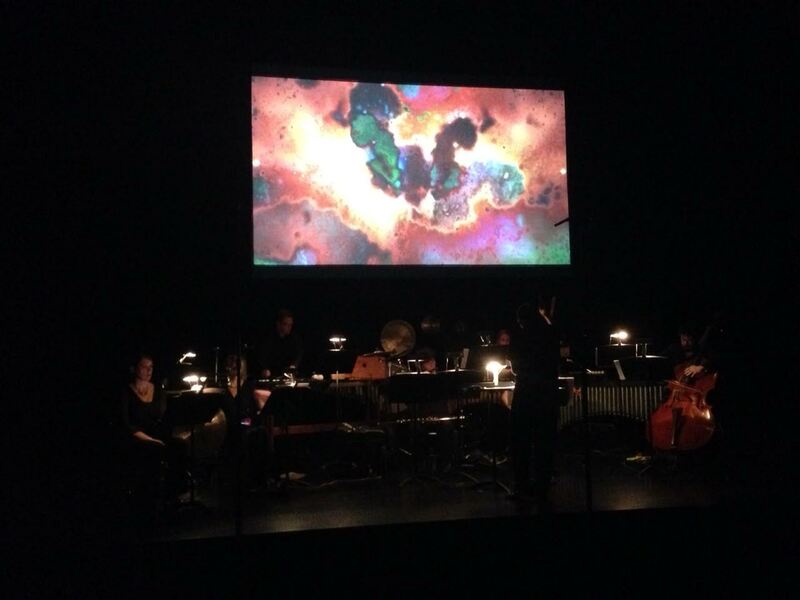 Continuum Contemporary Music are celebrating 30 years this season. Cosmic time, a history of the universe, and within that, a mapping of the development of human self consciousness, in film and music. I say collaboration, but Souvenir was always more about creating a structure within which composers and filmmaker could work more or less independently while contributing to a unified whole. The conundrum of how to unify a concert program while allowing creative autonomy to a diverse set of artists was a preoccupation at the time—Souvenir was one response. The process has a reflexive quality as composers reacted to the filmmaker’s description of their segment, with the filmmaker then reacting to their work. Because Continuum is in the business of music it was important that the images be set to music, rather than the other way around as is customary. This ensured the six pieces of music their own logic and coherence, independent of the film, allowing them an independent life. Which comes first, I always wonder, words (or image) or music? And is it necessarily an advantage to go first –and then have the other component reacting—given that the one who goes last has a kind of veto? Joseph Kerman –admittedly in a totally different context—said of music composition in Opera as Drama that “the composer is the dramatist”. I believe the reason this is so has to do with having the last word, being the one who gives the work its shape, taking the words of the libretto and then imprinting over that. Composers in film sometimes have comparable power, even if they’re working under the gun, without comparable glory or resources, but still getting the last word (or note). Is a composer necessarily better off composing something, leaving the filmmaker “then reacting to their work” (as Waring says)? I don’t see this the same way Waring does. I think the “other way around as is customary” is freighted with issues of dignity, when the composer’s music responds to a film. No matter who goes first or last, there are ways to create dignity –or kill it– in collaborations. I could be wrong (again…it happens all the time), but I believe Souvenir isn’t exactly what Continuum or Waring thought it might be. I am not saying I know better; I am not sure I really get what the project is doing. What I did not do is stick around for the talkback, for the members of the project to tell me what I was supposed to see, what the project supposedly means. I feel very strongly that if something has to be explained then the meaning may be too deeply buried, may even be something Harvey Olnick called “fictitious form”. What I have is a set of impressions and overall I am very impressed, but not reading this quite the same way as the program notes. I don’t think it’s necessarily what the creators thought it would be. That’s not so uncommon, where a creator makes something and it turns out a bit unexpectedly. Notice that I spoke of how the film might be understood: because i see it as a single 80-minute unit. While I suppose one could also speak of six films based on six compositions, that’s not how it came across to me. The fact that I was sitting in a darkened theatre, unable to see my program while film was projected and music played has an impact too. In my first viewing of the film + live music, I found it a very powerful experience. The opening two segments are relatively gentle, like nature documentaries, while the last two especially are filled with images of death. But that isn’t to say there’s anything really unpleasant at work. The scope of the project is truly mammoth, the cosmic dimension reminding me of Tree of Life: a film that also takes an epic perspective to evolution and our spiritual destiny. I chose to surrender to the imagery without trying to understand or make sense of who did what or what it signified. The linear progression of history is very consistent from beginning to end, so that the six segments cohere into a single film from my perspective, one that pulls the different musical styles together. With the exception of the last film, I found the expressive vocabulary very restrained, verging on minimalistic (not in the sense of pattern music, but rather a tendency towards reticence). Souvenir will be shown again Monday October 20th at the Betty Oliphant Theatre.